You really got me very worried! Imagine, I was expecting for you since March, and yet not even your letter came. Now that you are safe and sound, I am relieved! I was counting on you to be around when the time came, but then since you could not make it, I guess I'll have to manage on my own. . . Only I would feel better if you were around. Dondi [my cousin, arguably my father's favorite] got the gold medal for the year and he made everybody proud. I have decided na dito na sa Marbel [Koronadal] manganak, so Daday (my obstetrician) could attend to me. Anyway, sandali lang naman iyan. I can always go home the next day after delivery. I don't want to linger in a hospital . . . I can't stand the atmosphere! Well . . . time is really fleeting. Come May 30th, we will have our 1st wedding anniversary. I wish you good health and happiness! Today they celebrate their 26th anniversary. How can I not praise the Lord for giving me parents who love the Lord and each other, even after all these years? aww, that's sweet. :) happy anniversary to them. Anonymous1 , I think this is you, Michelle! Thanks for dropping by. Maimai, yes! Love to Auntie Daisie and Uncle Bing, too! Wow! I dunno why I love to hear about parents' love stories. Congrats to your parents! And in english pa ang letter ah! I recall seeing photos my parents said to each other--Mom in Manila, Dad in Saudi (yes, he was there too), with notes of jest or love in English at the back. april 28, 1985 was the date my parents got married. they just celebrated their silver anniversary this year! it's just so nice to know that this day is so full of love. congratulations to your parents. Anjo, Saudi was the place to be! I-publish mo rin ang letters. In love letters, cheesier is always better. 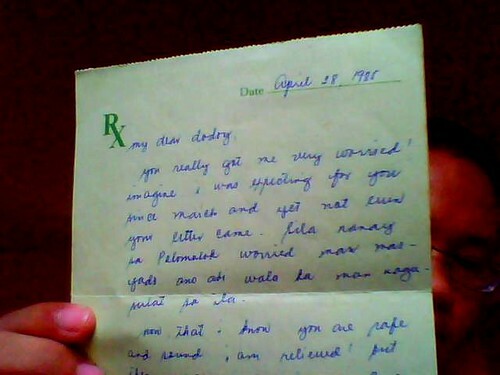 april 11 '83 naman parents ko. haha. gusto ko rin makahalukay ng ganyang memorabilia (alam ko tinatago ni mum halos lahat e) hahaha! May mahahalungkat ka niyan, Marj! Go lang! Thanks, Mike! I wish that as well. Im Anonymous 3 (april 28, 1985), i dont know you personally, but your posts appear on my inbox, and im glad it does. Thanks, Red. That's really an encouragement.